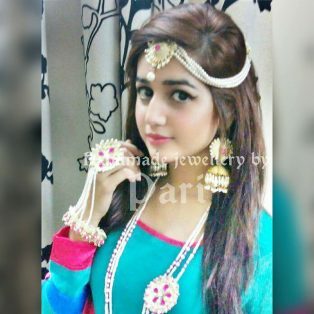 Women’s love for jewelry can never fade out. 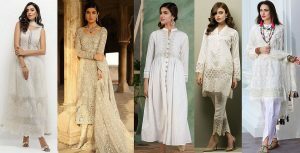 It’s not just dire need of fashion but it does add up to the femininity of the eastern women. 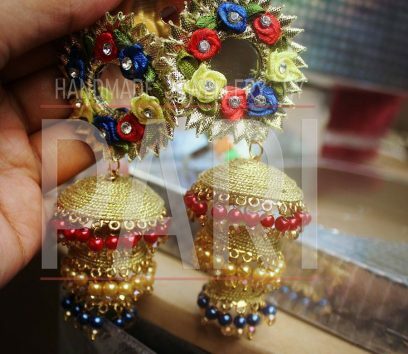 Those glittering Jhumkis, sparkling bangles, heavy necklaces, trendy matha Pattis, delicate nose rings, and every piece of it just mesmerizes you with a single glimpse. 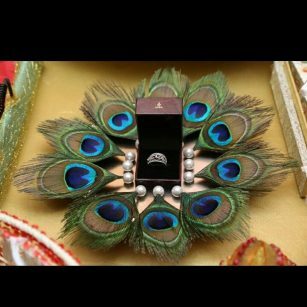 In spite of that, we natural crave for something distinctively unique, nobody wants to carry around same old designs and styles for every event. 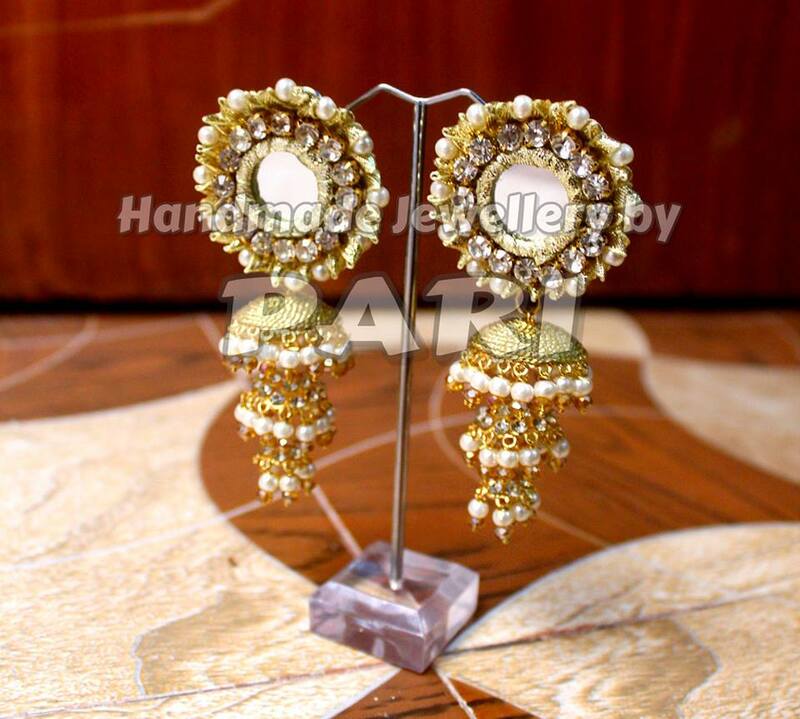 This is the reason that handmade jewelries are generally more popular and greater in demand in Pakistan. 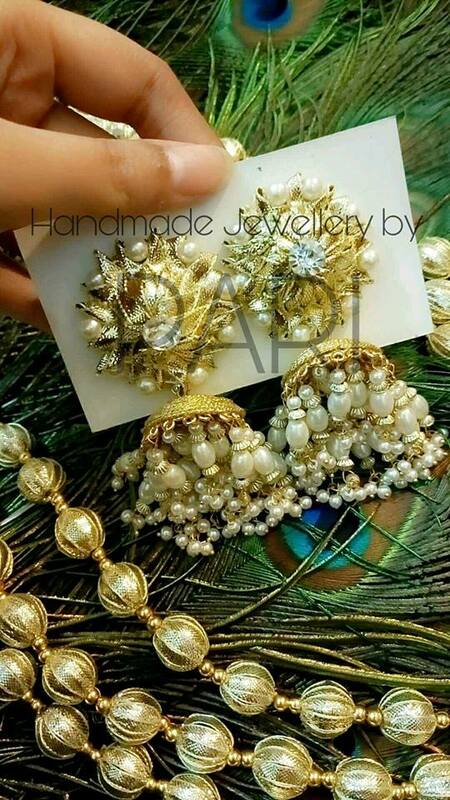 Designed creatively under the signature label of eminent jewelry artists, these are the jewelries that will suit best to your needs. Handmade Mayon Mehndi Jewelry by Pari Designs Collection in this regard is quite famous for its variant patterns. 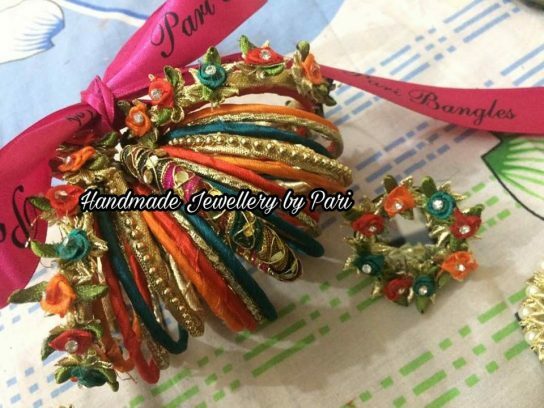 Pari jewelry Designs has earned good repute through its uniquely crafted designs for various occasions. 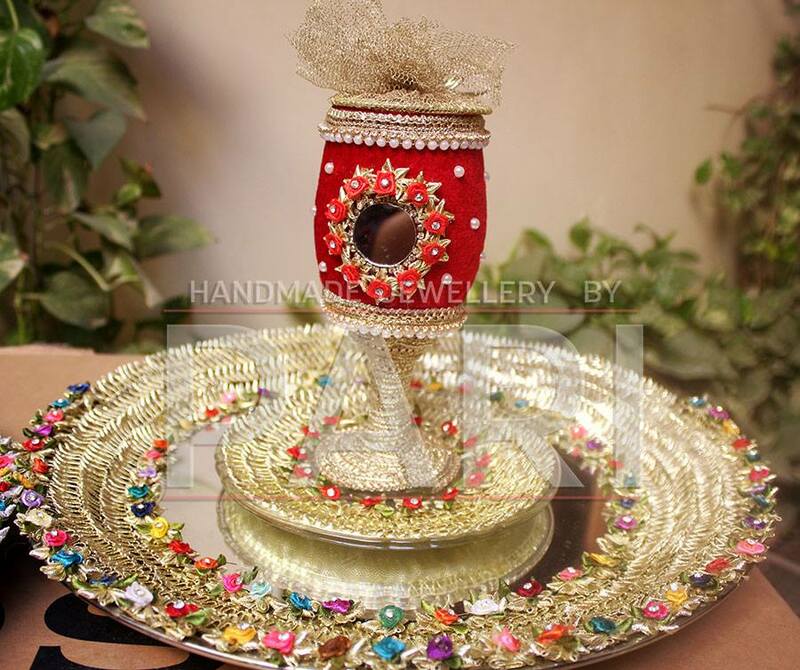 Formal, informal, wedding, festive events, you can order as per your requirement. 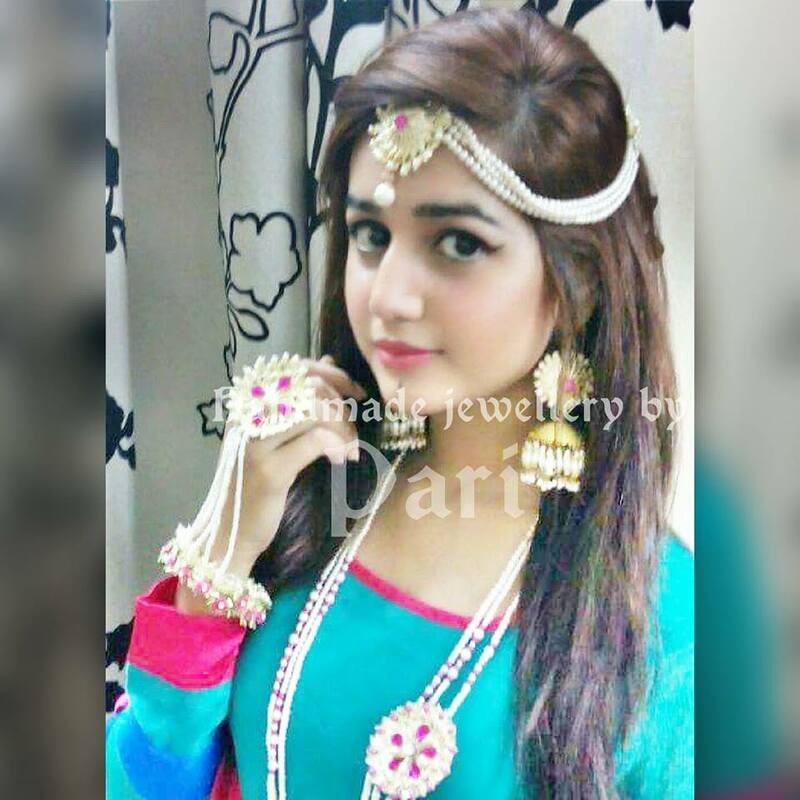 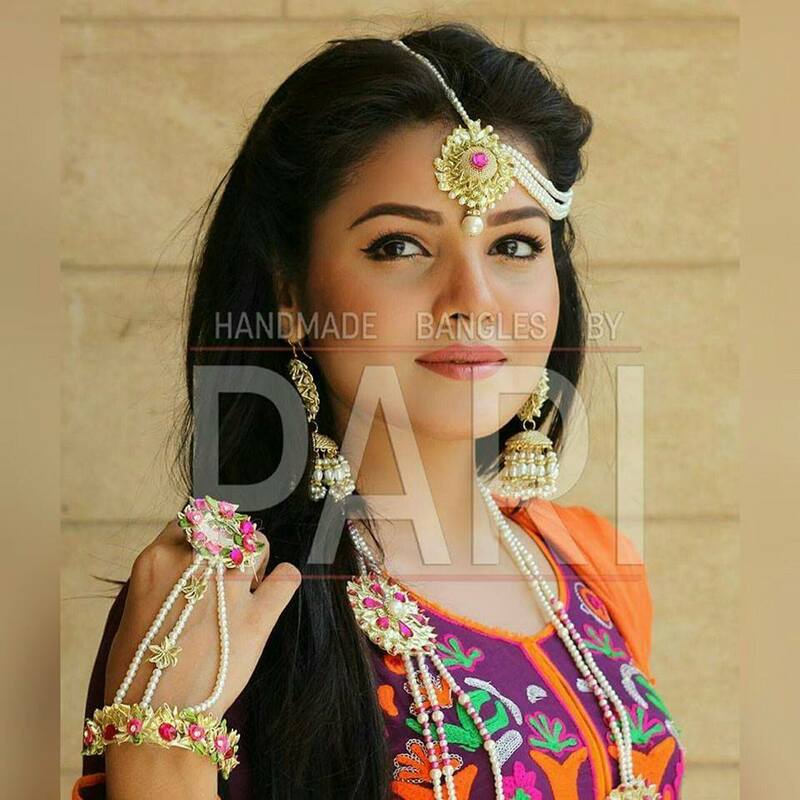 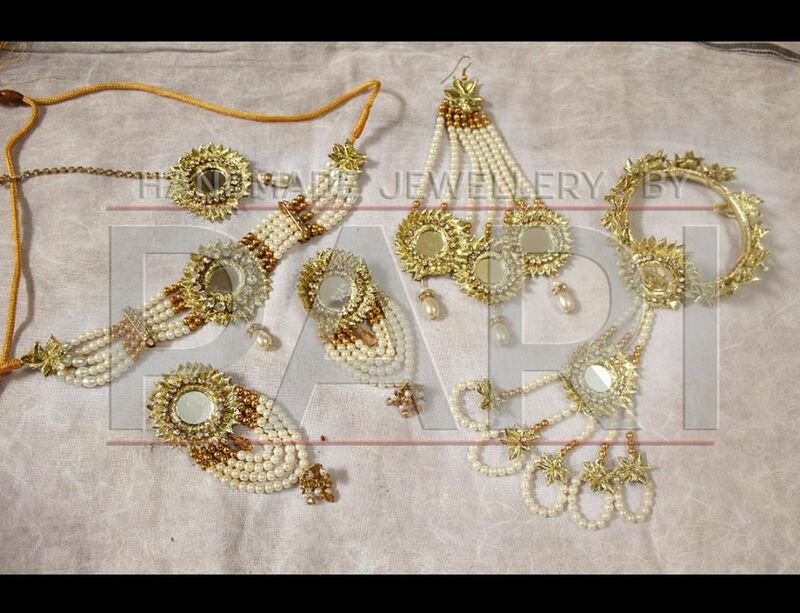 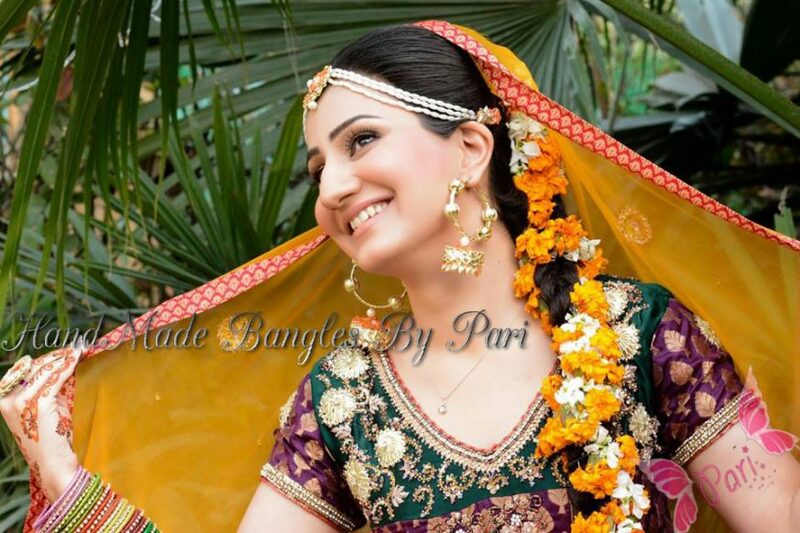 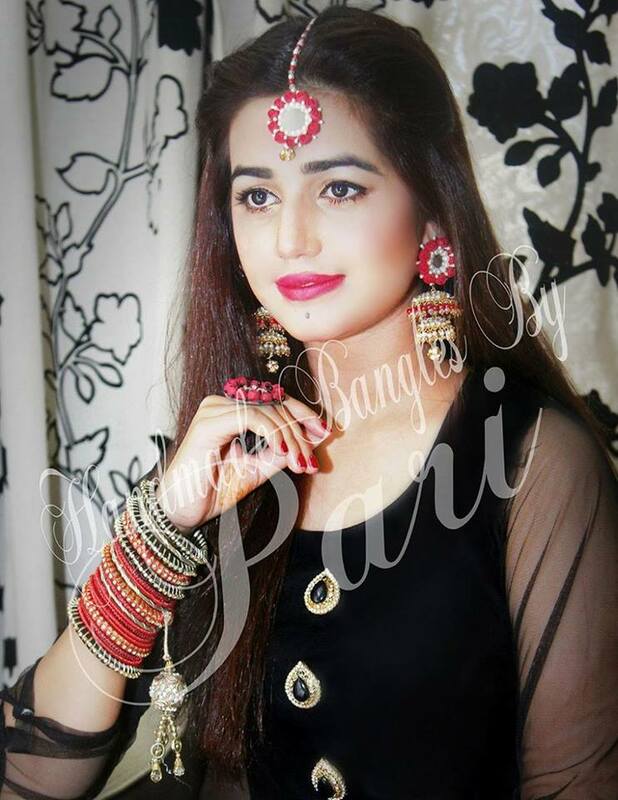 This is the reason that many of our television artists and celebrities also adore and likes to carry jewelry by Pari. 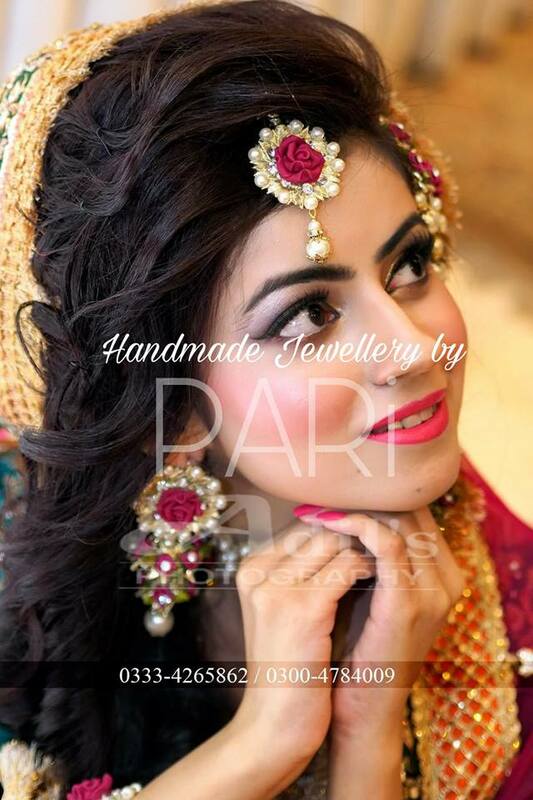 The extremely talented Yumna Shehzad is the real brains behind the fascinating ideas and designs. She uses various techniques to incorporate into one, floral art, mirror work and use of pearls. Every new collection has her distinctive touch, let’s scroll more to explore her handmade jewelry collection for Mehndi and mayoon. 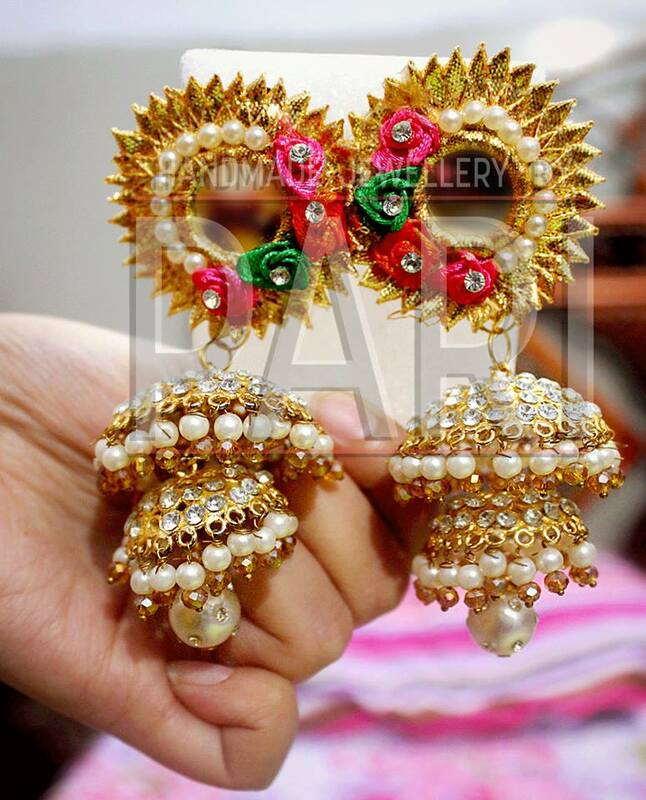 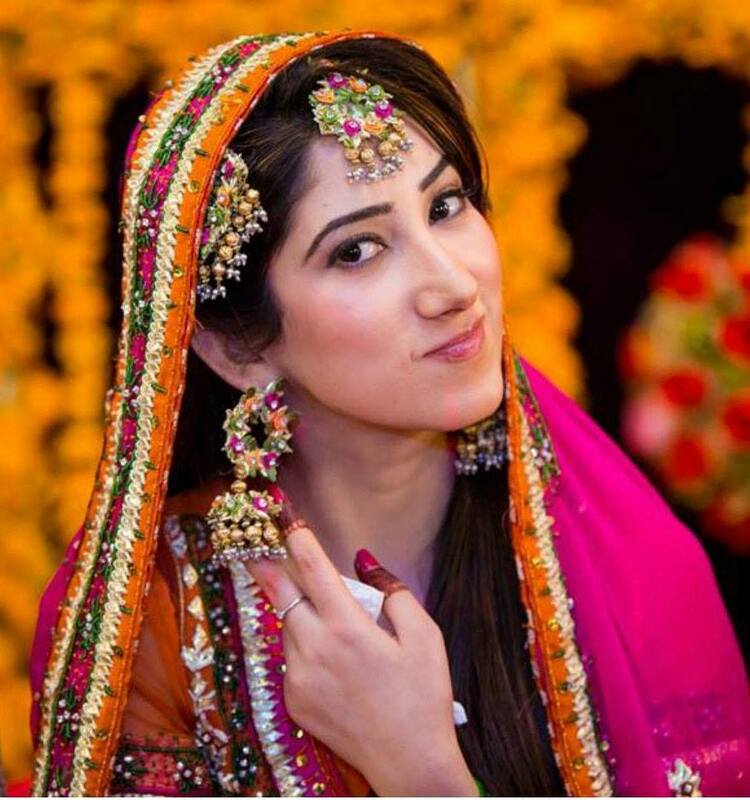 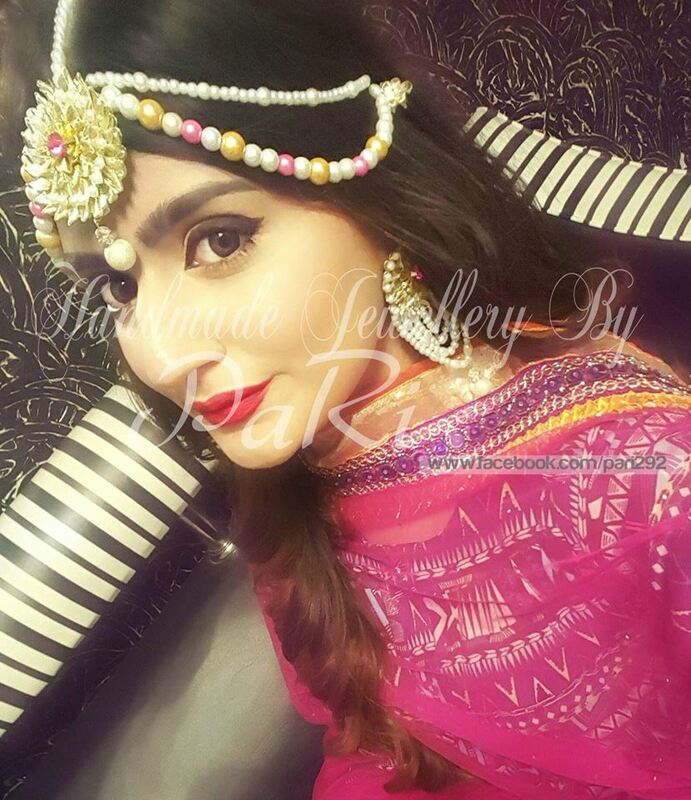 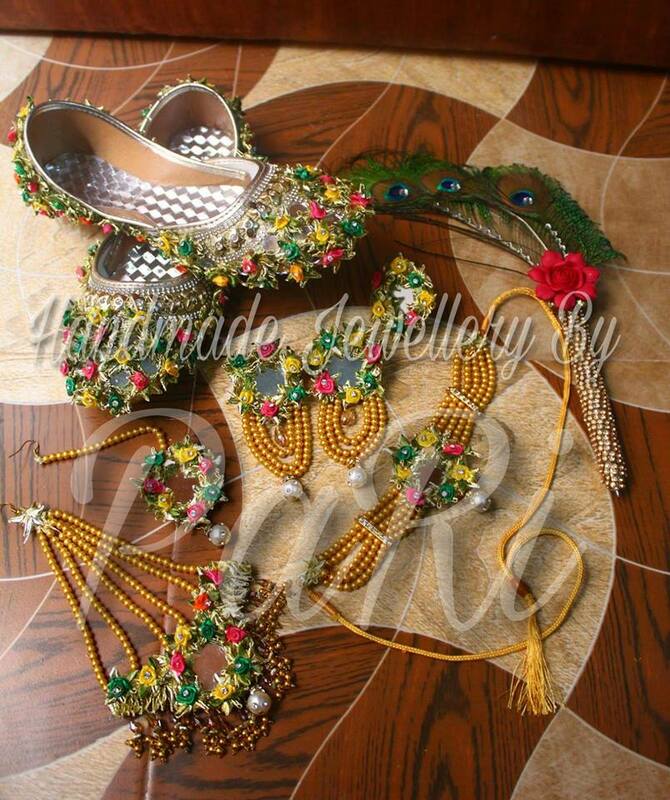 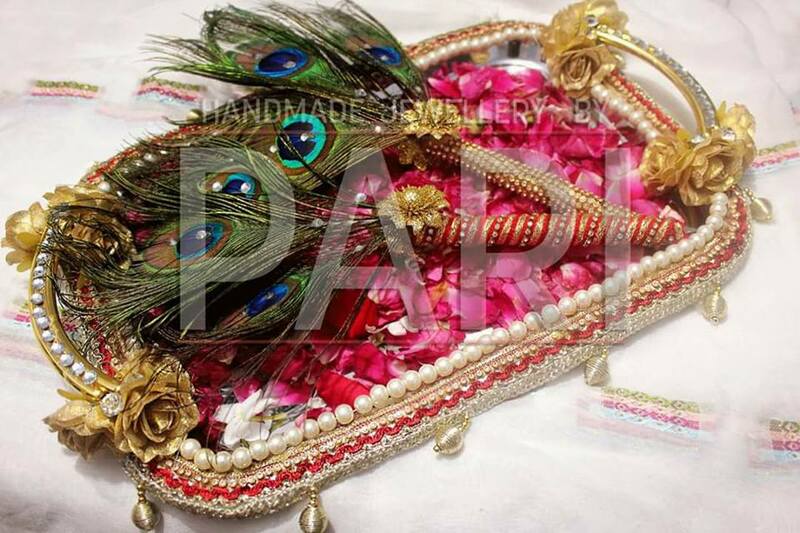 Have a look on the categories of Handmade Mayon Mehndi Jewelry by Pari Designs Collection. 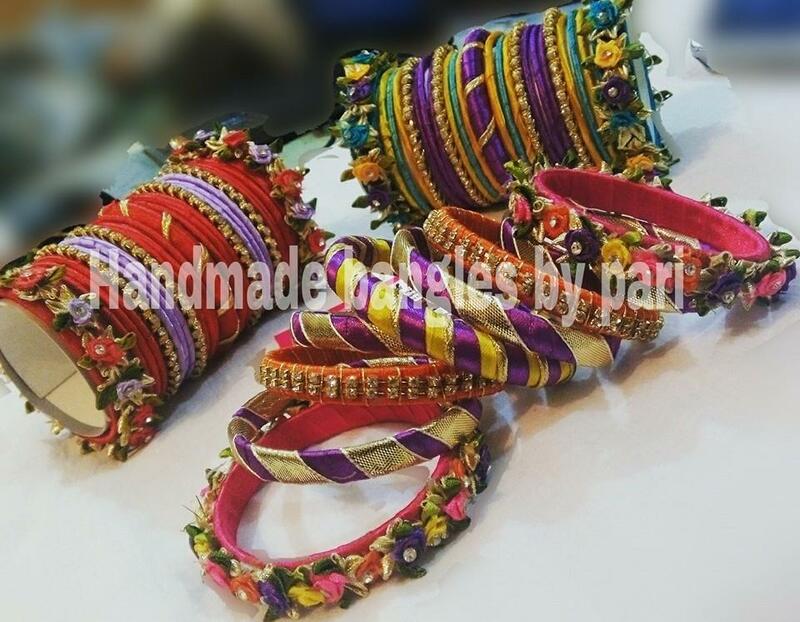 These bangles are so rich in color and are diverse in forms. 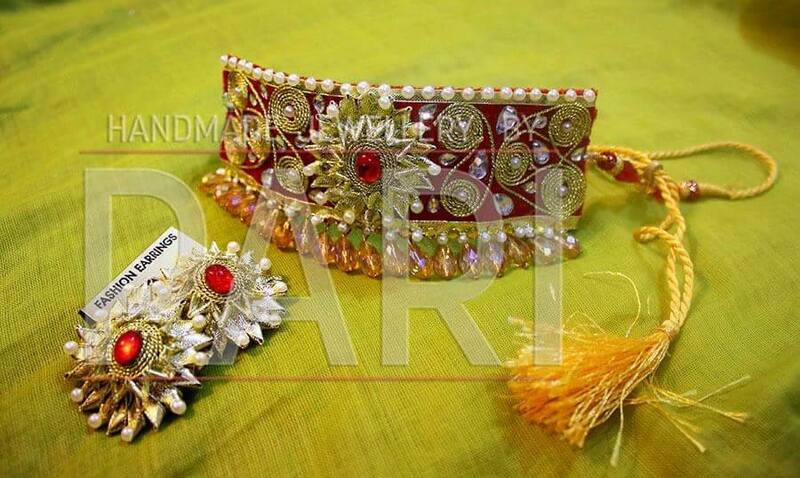 From simple shiny bangles to the floral ones, every set can best fit to your mehndi mayoon outfit. 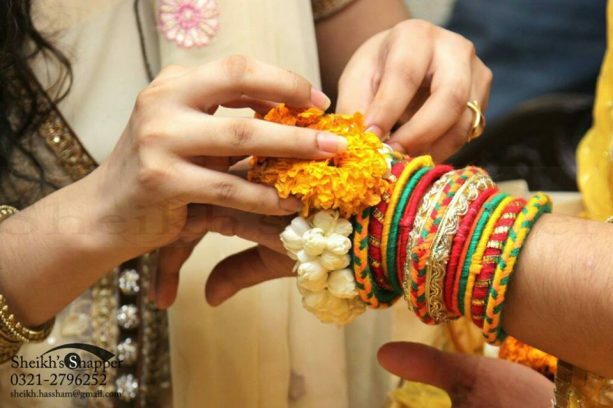 The colors are used in set themes, it’s not just yellow, orange or green, but various other colors are added in delicate flowers like pink, red, purple and blue to add up the contrast. 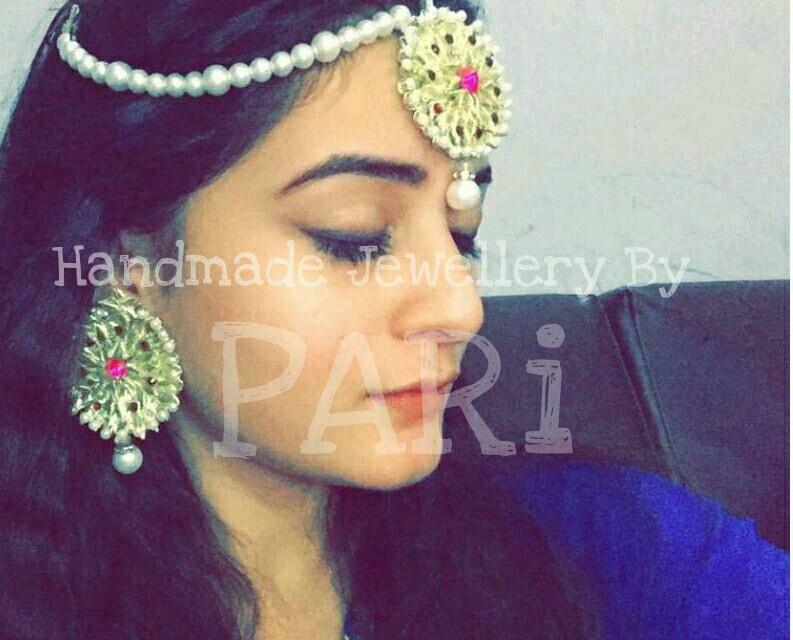 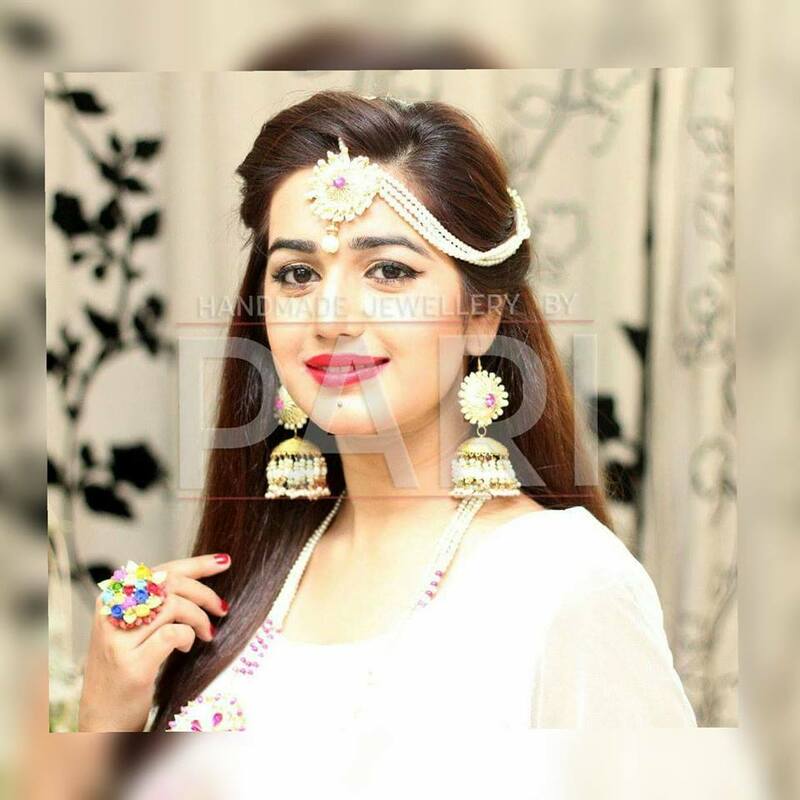 Jhumkis and earrings by Pari demands special mention her, because of the depth and volume of their alluring beauty. 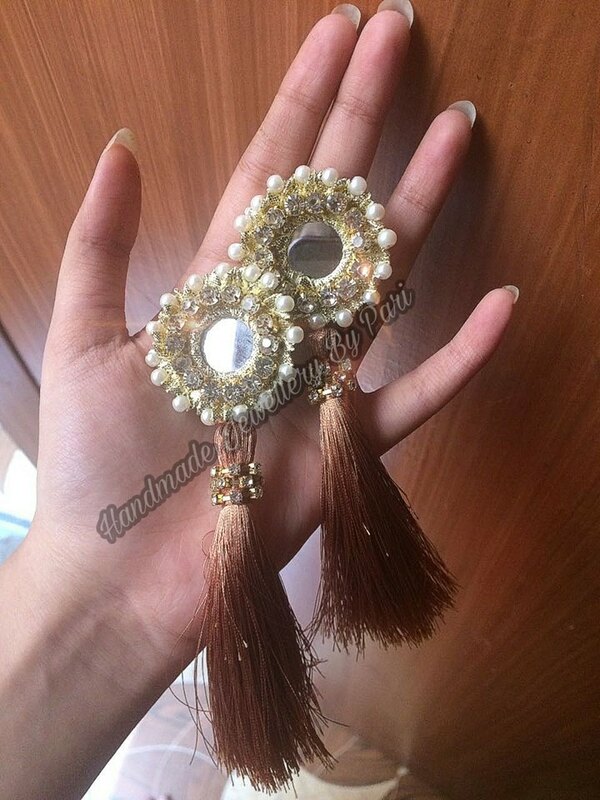 For jhumkis there is use of mirror work paired with hints of gotta in the upper part whereas down below she uses layers of hanging pearls. This creates a magical display for the sight. 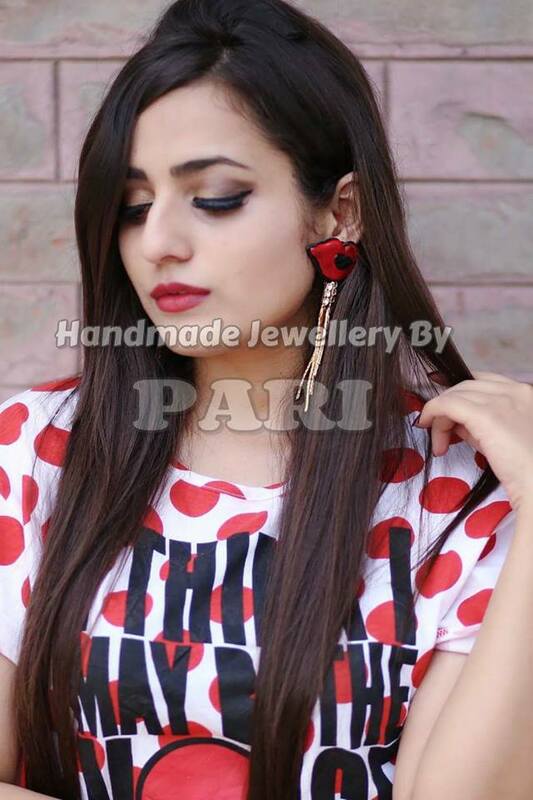 Round delicate earrings are also available in this collection, so you can try these too if you want to keep your look simple and decent. 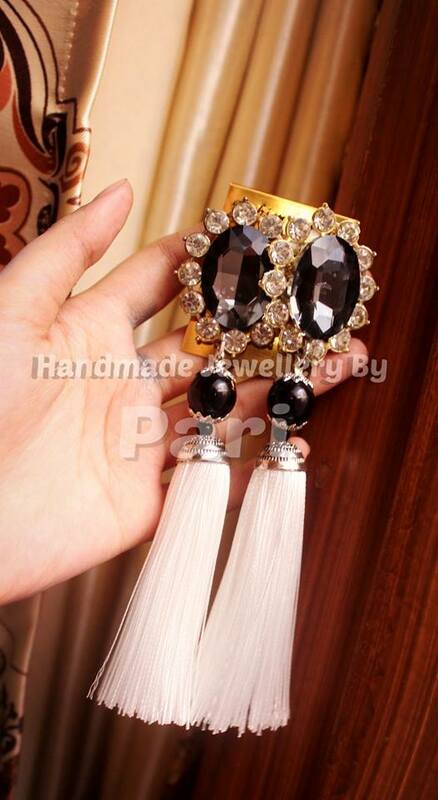 As tussled earrings are gaining immense popularity these days, these are also designed for Mehndi and mayoon by Pari. 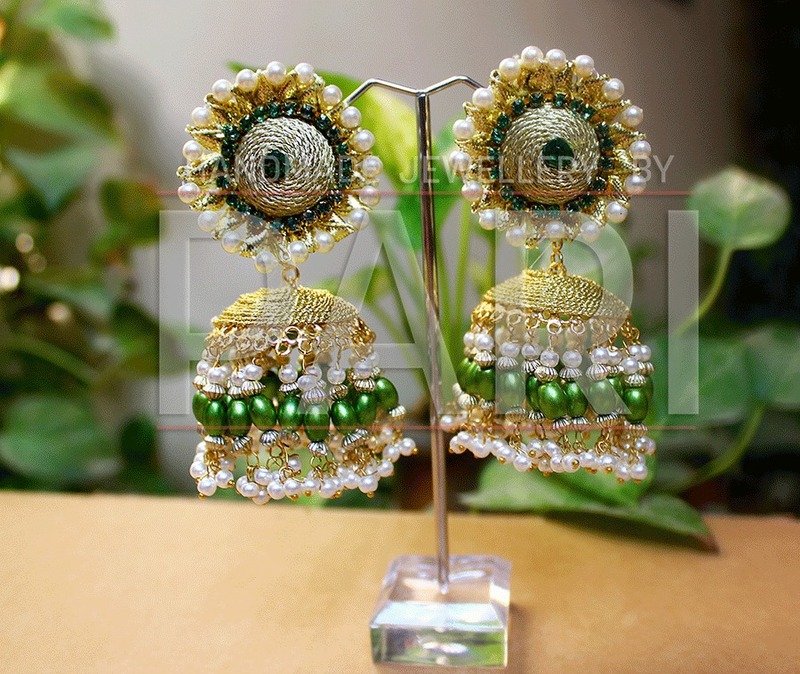 The tussles are studded with matching or contrasting pearl on top. The upper round portion is intricately crafted with loads of shine and shimmer to complement the hanging tussles down below. 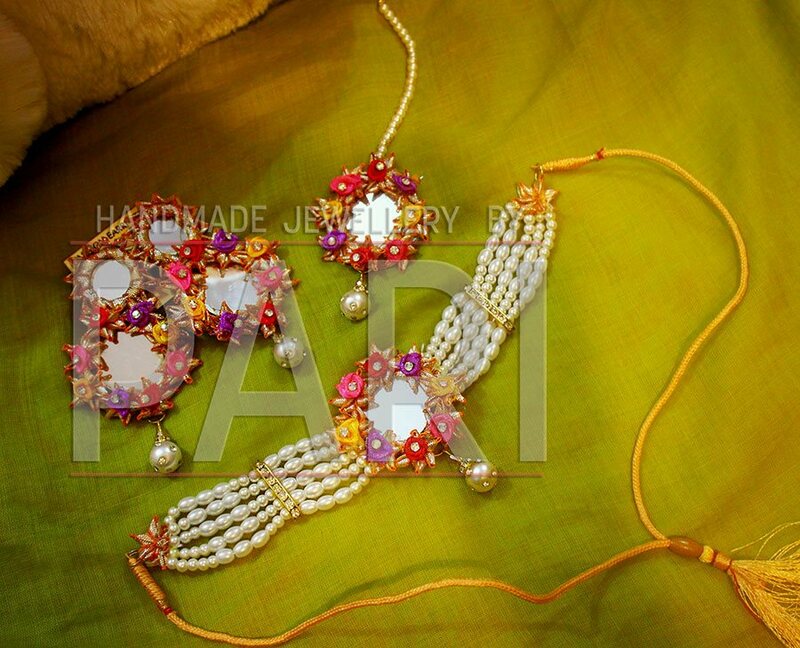 Matha Patti and tikkas by Pari are absolute magic, studded with series of pearls and chains. For Mehndi, these kept richly colourful, flooded with small flowers in contrasting colors. 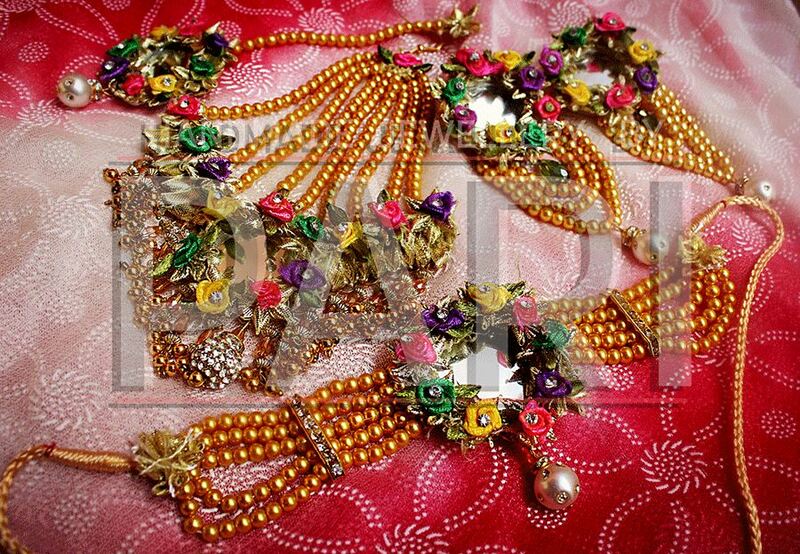 In between these flowers there is use of pearls and mirrors. 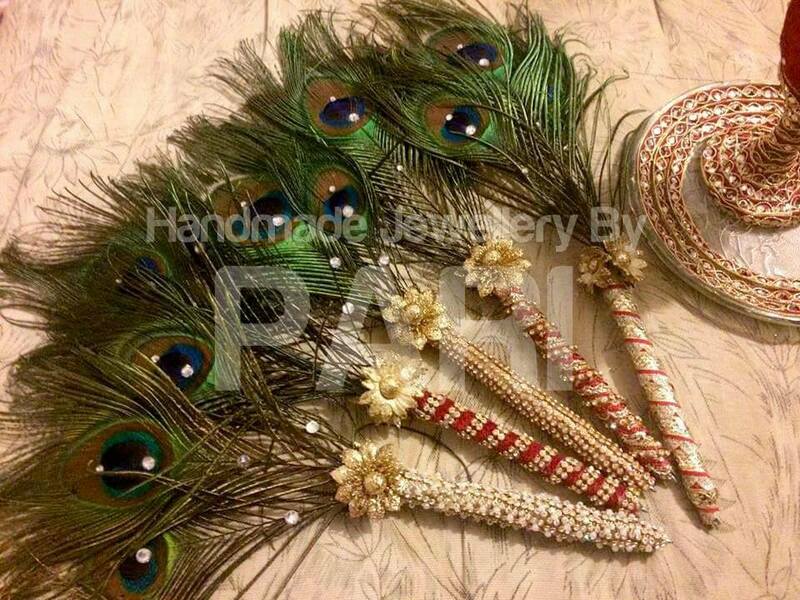 A complete matching set for your day is what you all have been looking for. 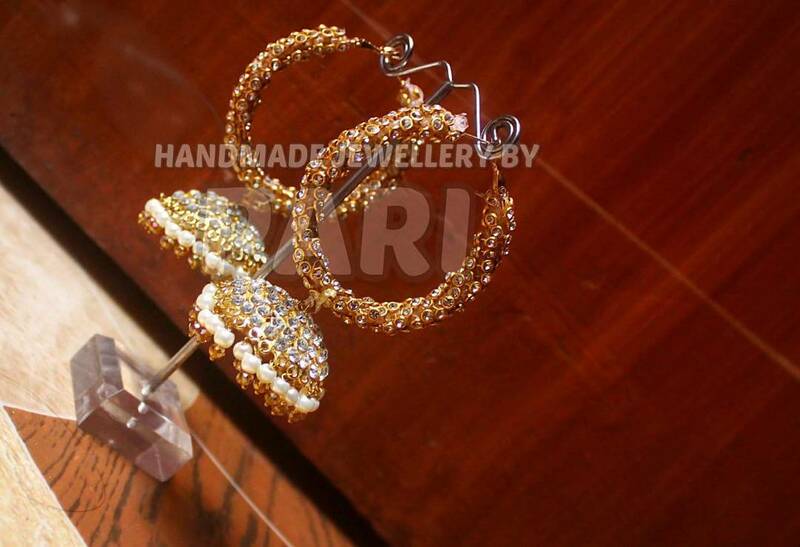 Pari designs do bring you that joy with sheer pleasure. 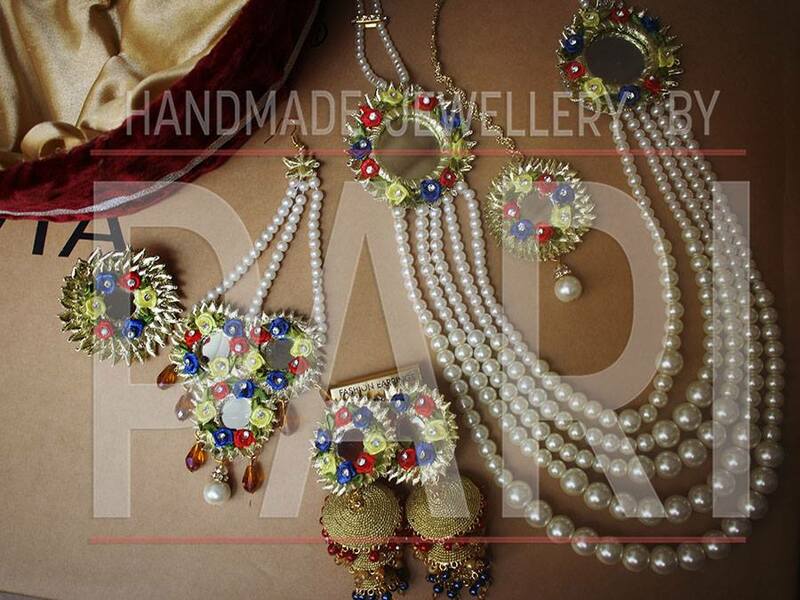 The package covers the pieces based on your outfit and demands. 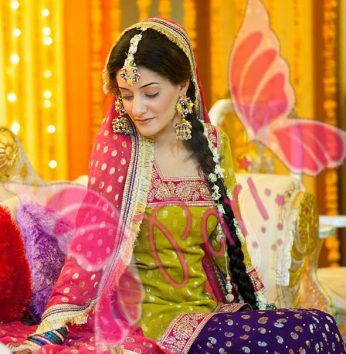 Sometimes it’s just heavily embellished mehndi matha Patti with prominent earrings and bangles. 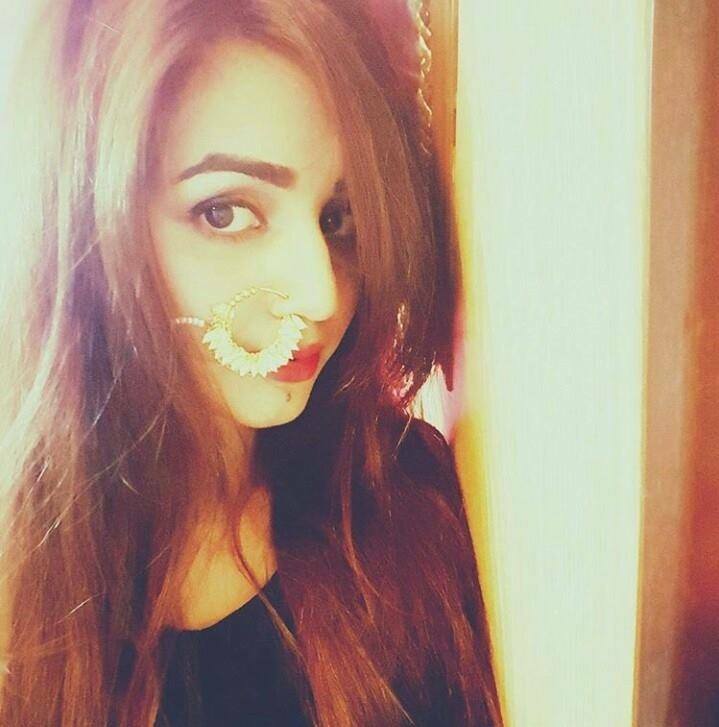 Sometimes the necklace, bangles and the rings. 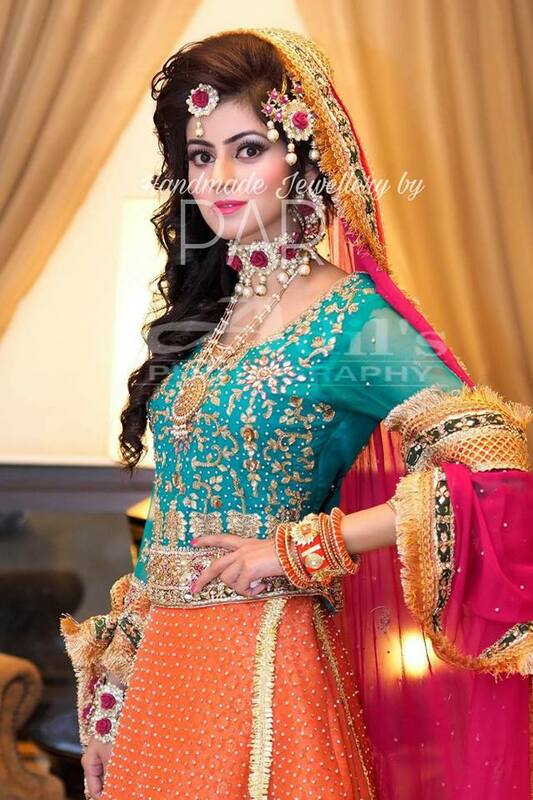 Perhaps you order whatever you consider perfect for your bridal outlook. 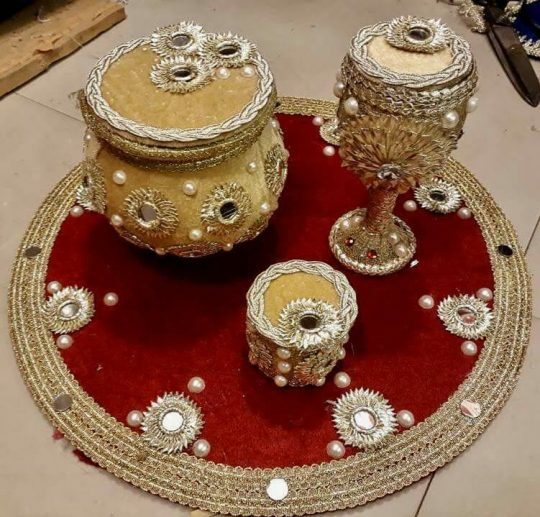 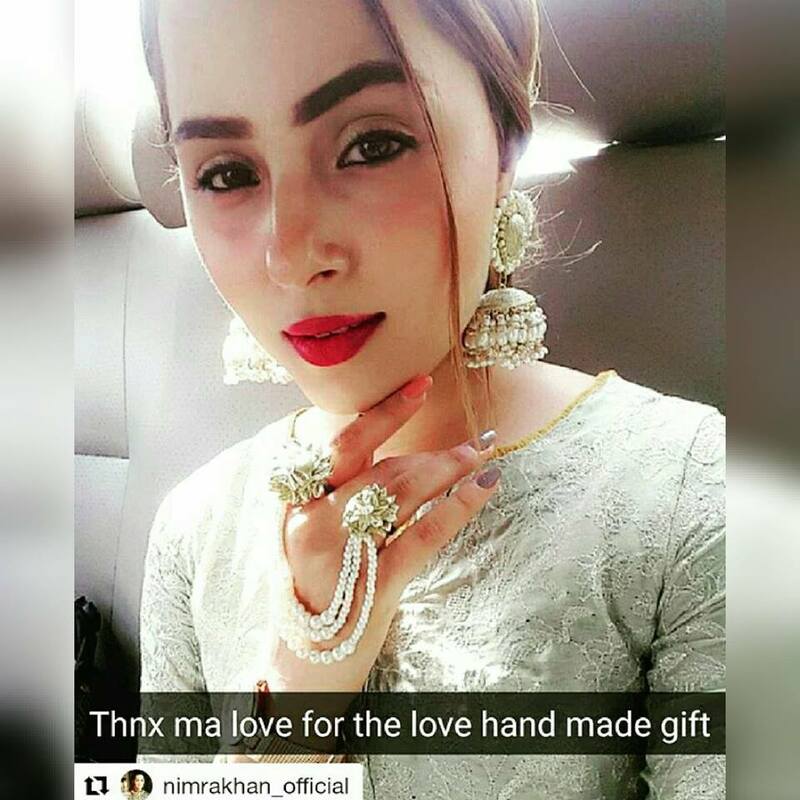 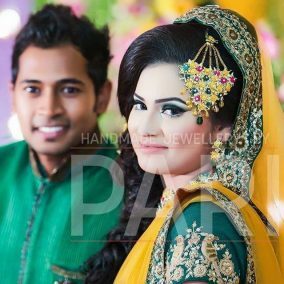 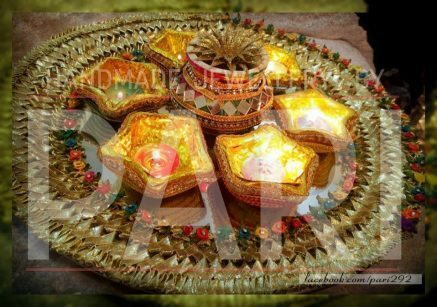 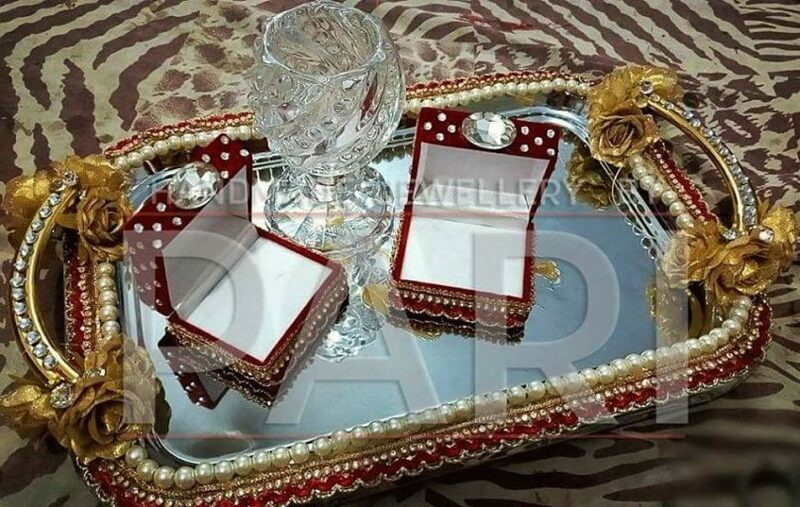 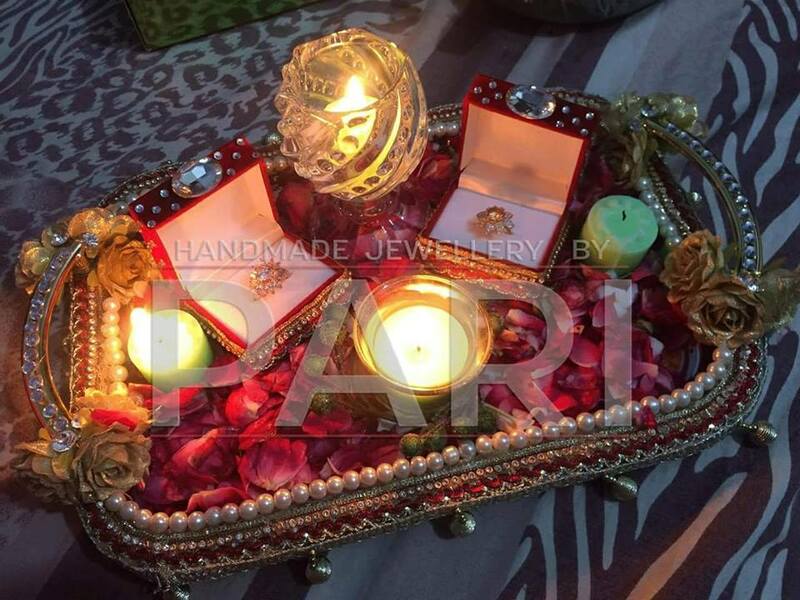 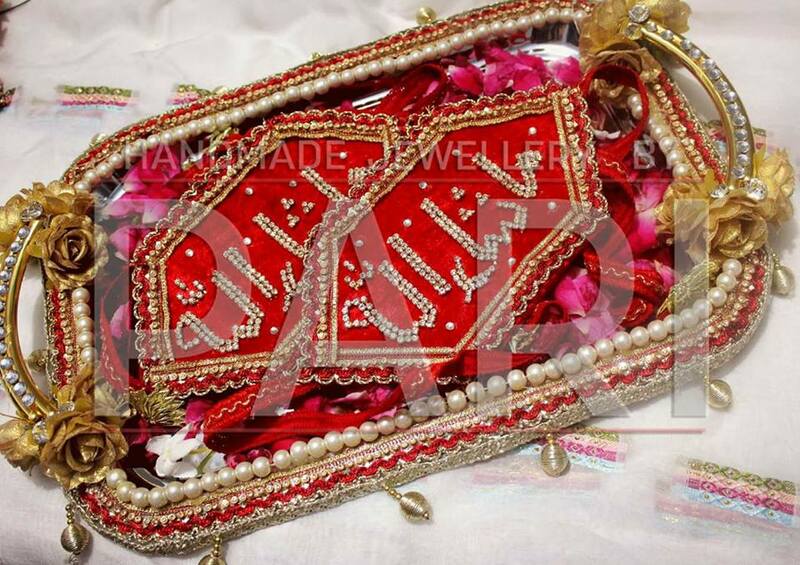 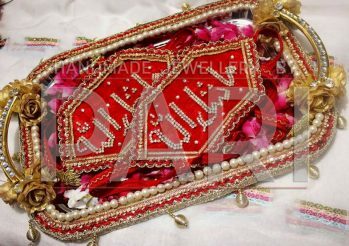 Pari designer also designs mehndi and barat related accessories like handmade doodh pilai glass, thaal, engagement ring boxes, tray, nikkah pens, bazu bandh, etc. Have a look on the below posted patterns.